You can install jxProject on all of your computers at no cost. You'll also be able to share your project plans with anyone that has access to the Internet, because everyone on the Internet can access and install jxProject. Windows, Linux and Solaris are supported platforms and many Mac OSX users have reported great success using jxProject. The free version is supported by advertising, in the upper right hand corner of the application there is a sponsor window to display the advertisements. A new image is scrolled into view every few seconds. The free version can be converted to commercial version without the advertising by purchasing a serial number ($20.00 USD) and activating the software. See the benefits of activation in the Purchase / Buy section of this site. Built in, self contained constraint solver. Supported task link types: Finish to Start, Finish to Finish, Start to Finish, Start to Start, Resource User with positive/negative lag. Full Undo/Redo and Cut/Copy/Paste and Drag/Drop to other applications functionality. Critical Path Analysis; start float, finish float, early start, late start, early finish, late finish. User can have values displayed in the table and graphically on the charts. Critical task criteria is user definable; critical tasks are color coded on the chart. World class accuracy: All calculations are performed in milliseconds. Duration driven tasks are scheduled within a (+/-)5 millisecond tolerance, work and span driven tasks are scheduled within (+/-)2 minute tolerance. True 24 hour representations of all schedules for tasks, resources and calendars. Powerful rule based scheduling allows 100% custom schedule for each calendar/resource including part time resources. Fixed task key number assignments, can be re-sequenced by user via right mouse click on header. 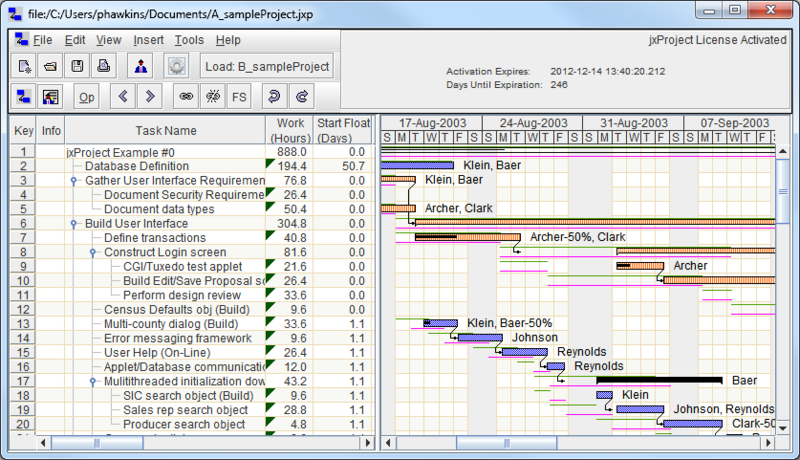 Full printing support including the ability to “shrink/expand” the project plan onto fewer/more pages. Support for millions of calendars and resources. Ability to overlay tasks assigned to resources on their schedules. Three sample project plans included for learning and experimentation are easily accessible via the “Help->Sample Projects” menu. Be sure to push the “Op” button and watch the optimizer shrink the project plan. Multi-platform capable: Windows, Linux, Mac, Solaris. If you like jxProject, talk to other Project Managers at your company about the possibility of making jxProject your company's standard Project Management tool. Be sure to talk to your Operations Manager about this initiative. They will need to install the latest JRE from Oracle on every new computer that comes into your company. The jxProject application can be installed on each computer, or run from a single location on a server, accessible to the client machines. This can make the updating of a the company Project Management software as easy as installing a single copy of the software. All of the user documentation on jxProject is posted on this web site so you can take a good look at its capabilities. jxProject is a 100% Java application running on the 1.6 or higher version of the Java Runtime Environment. Check the "News" section of this web site for regular updates on release dates and other goings on.